Turkey has remained the worst jailer of journalists in the world for the second consecutive year, the Committee to Protect Journalists (CPJ) said on Wednesday. Releasing its annual press freedom report, CPJ said: “Despite releasing some journalists in 2017, Turkey remains the world’s worst jailer for the second consecutive year, with 73 journalists behind bars, compared with 81 last year. 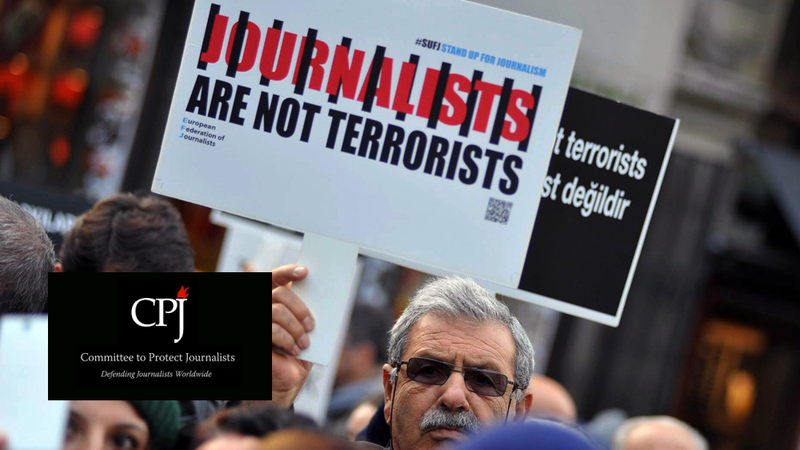 Dozens more still face trial, and fresh arrests take place regularly.” “In several other cases in Turkey, CPJ was unable to establish a link to journalism. Other press freedom groups using a different methodology have higher numbers. Every journalist CPJ found jailed for their work in Turkey is under investigation for, or charged with, anti-state crimes, as was true of last year’s census. According to Turkey Purge’s own count, 308 journalists have been remanded pending trial since the July 15, 2016 coup attempt, with 180 of them still being kept behind bars. CPJ said the number of journalists imprisoned for their work across the world hit a historical high in 2017, as the US and other Western powers failed to pressure the world’s worst jailers–Turkey, China, and Egypt–into improving the bleak climate for press freedom.